Microsoft Office Home and Student 2010 32/64-bit Licensed for 3 PC's Family Pack Retail Box NEW!! Microsoft Office Home and Student 2010 32/64-bit Licensed for 3 PC's Family Pack Retail Box NEW!! Microsoft Office Home and Student 2010 is a suite of essential software applications that enables homes and students to accomplish tasks quicker and easier. Comprised of the 2010 versions of Excel, Word, PowerPoint, and OneNote, this software suite empowers you to create great looking documents and presentations, build powerful spreadsheets, and store all of your notes in a central location. With improved menus and tools, enhanced graphics and formatting capabilities, new time and communication management tools, and more reliability and security, Office Home and Student 2010 makes it easier and more enjoyable for you to get things done at home or at work! This is the Full Version with DVD New & Never Opened!! Comes in Original Microsoft Retail Packaging. Packaging: Sealed Retail Box in Mint Condition. Actual item shown in picture! *Licensed for Installation on up to 3 PC's. Not for use in any commercial, nonprofit, or revenue generating activities, or by any government organization. This software includes the same software as the regular retail versions but with discounted pricing. The software is not limited or different from the commercial versions. All our software products are thoroughly checked by multiple methods including black light, 50x magnification, coa verification, watermarks, holograms, interwoven security threads, uv fibers & microprint, etc. to assure authenticity! Please confirm to be sure you are buying the correct version for your needs. No CD/DVD Drive? No problem! 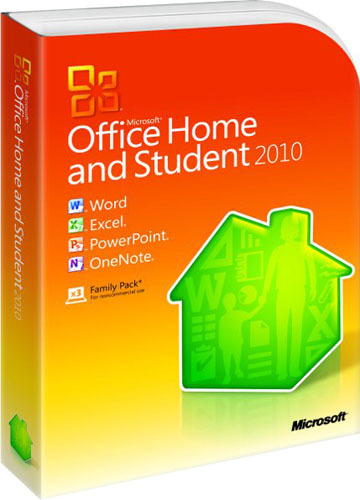 Netbook PC users with no CD/DVD drive can download Office Home & Student 2010 from www.office.com/downloadoffice if you do not already have the Home & Student 2010 Trial preloaded on your PC. Then use the enclosed Product Key to activate the software. 500-megahertz (MHz) processor or higher. 256 megabytes (MB) of RAM or higher; 512 MB recommended for graphics features, Outlook Instant Search, Outlook with Business Contact Manager, Communicator, and certain advanced functionality. 3 gigabyte (GB) available disk space. 1024 × 576 or higher-resolution monitor. Windows XP with Service Pack (SP) 3 (32-bit), Windows Vista with SP1 (32-bit or 64-bit), Windows Server 2003 SP2 (32-bit or 64-bit) and MSXML 6.0 (32 bit Office only), Windows Server 2008 or later (32-bit or 64-bit), Windows 7 (32-bit or 64-bit). Terminal Server and Windows on Windows (WOW) (which allows installing 32-bit versions of Office 2010 on 64-bit operating system, excluding Windows XP 64) are supported. Additional Requirements and product functionality can vary based on the system configuration and operating system. Certain advanced functionality requires connectivity to Microsoft Exchange Server 2007, Microsoft SharePoint Server 2010, Microsoft Office Communications Server 2007, or Microsoft SharePoint Foundation 2010. Certain Microsoft OneNote features require Windows Desktop Search 3.0, Windows Media Player 9, Microsoft ActiveSync 4.1, microphone, audio output device, video recording device, TWAIN-compatible digital camera, or scanner; sharing notebooks requires users to be on the same network. Send to OneNote Print Driver and Integration with Business Connectivity Services requires Microsoft .NET Framework 3.5 or Windows XPS features. Certain features require Windows Search 4.0. Internet Explorer 7, or Internet Explorer 8, 32-bit browser only. Internet functionality requires an Internet connection. 512 MB of RAM or higher recommended for Outlook Instant Search. Grammar and contextual spelling in Word 2010 is not turned on unless the computer has 1 GB memory. Silverlight plug-in. See Get started with Microsoft Silverlight (http://go.microsoft.com/fwlink/p/?LinkID=169372).